Brazilië is een geweldig land om te bezoeken en het ontwikkelt zich zeer snel. Het eten is geweldig! Meatlovers, fruitliefhebbers en liefhebbers van toetjes houd je klaar! Er is surfen het hele jaar door! Veel feesten en drinken. Mooie, vriendelijke en open mensen! De Braziliaanse vrouwen houden van buitenlanders! Het weer is warm en de natuur spectaculair! 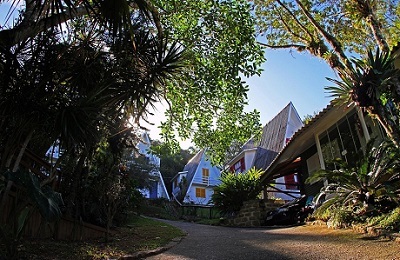 Lagoinha and Ponta das Canas Surf Camp - Florianopolis, Santa Catarina Algehele gastenwaardering: ★★★★★ 5 gebaseerd op 4 beoordelingen. 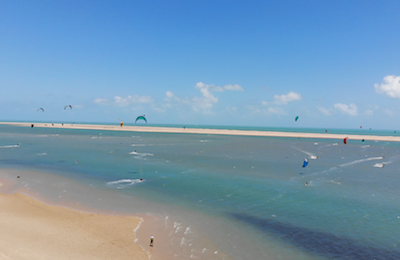 Brazil Downwind Tour Kitesurf Trip - Ilha do Guajiru, Ceará Algehele gastenwaardering: ☆☆☆☆☆ 0 gebaseerd op 0 beoordelingen. 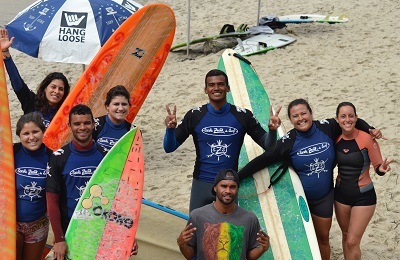 RIO Surf School, Tours & Surf Camp - Recreio Macumba, Rio de Janeiro Algehele gastenwaardering: ★★★★★ 4.8 gebaseerd op 5 beoordelingen. 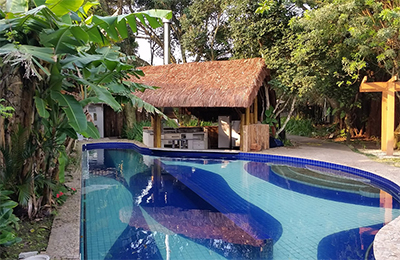 A 30-minute drive from Copacabana and downtown Rio, in the lively seaside resort of Recreio dos Bandeirantes, the Surfcamp enjoy a perfect location just two minutes walking from the Surfing beach of Macumba. 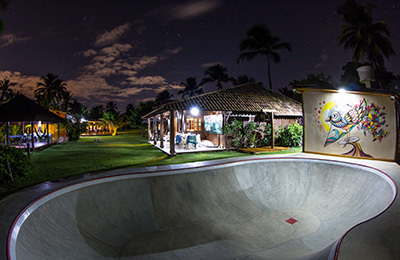 The Rio Surf house is a spacious building in a tropical garden, a fun, friendly atmosphere. 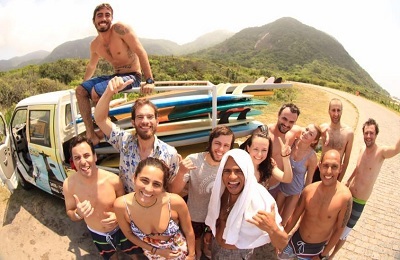 Whether a seasoned surfer looking for the perfect break or a beginner who wishes to learn the sport, Rio Surf Camp offer a package for everybody. Busca Vida Beach Surf Camp - Salvador, Bahia Algehele gastenwaardering: ★★★★★ 5 gebaseerd op 2 beoordelingen. 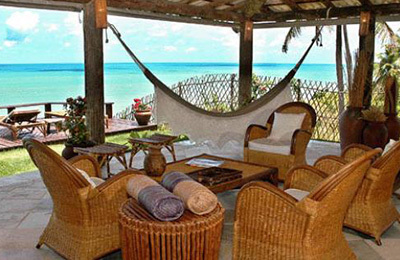 Located just 15km from Salvador de Bahia international airport, inside a private natural conservation area. 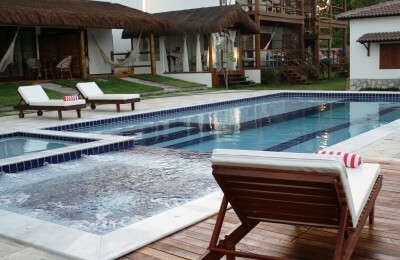 The lodge is just 70 meters far from Busca Vida beach, a sanctuary of waves and tranquil surroundings. The stores are 5 km far from the lodge. You are able to explore the area by using our bikes or our Stand up paddle boards on the lake at the back land. 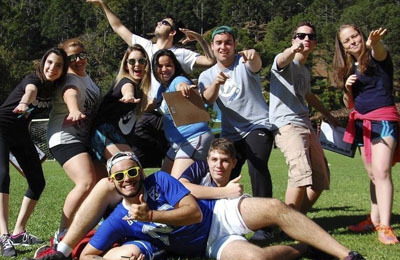 Teens Adventures Camp - Serra da Mantiqueira, Minas Gerais Algehele gastenwaardering: ★★★★★ 5 gebaseerd op 5 beoordelingen. 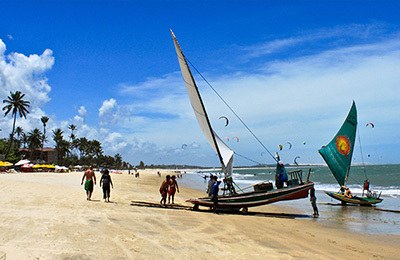 5 days Kitesurf Trip - Cumbuco to Jericoacoara, Ceara Algehele gastenwaardering: ★★★★★ 5 gebaseerd op 1 beoordelingen. 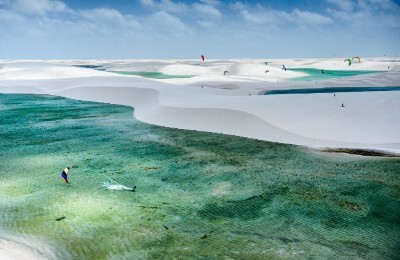 It is a kitesafari brings you the adventure of doing a several days-long ongoing downwinder along the tropical and largely deserted sandy beaches of Ceará, Piaui and Maranhão in North Brazil. And it comes with the service and support to make it a truly enjoyable tour with a minimum of worries and plenty of new things to see and experience. 5 days 'Waves' Kitesurf Trip - from Cumbuco - Jericoacoara, Ceara Algehele gastenwaardering: ★★★★★ 5 gebaseerd op 1 beoordelingen. 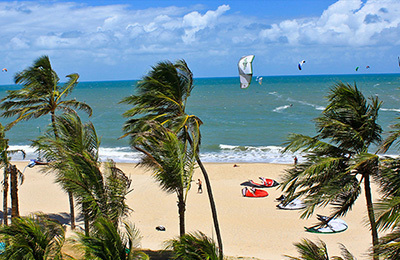 Northeast Coast of Brazil Kitesurf Trip - Fortaleza, Ceara Algehele gastenwaardering: ★★★★★ 5 gebaseerd op 1 beoordelingen. 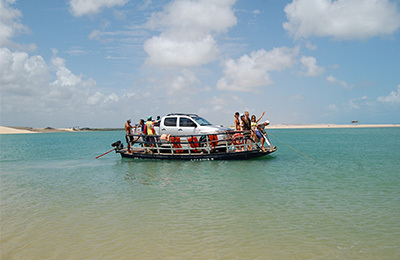 14 days Kitesurf Trip - From Cumbuco to Atins, Ceara Algehele gastenwaardering: ★★★★★ 5 gebaseerd op 1 beoordelingen. 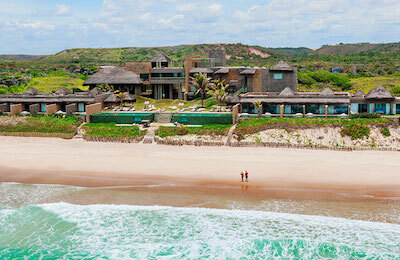 9 days Kitesurf Trip - from Jericoacoara to Atins, Ceara Algehele gastenwaardering: ★★★★★ 5 gebaseerd op 2 beoordelingen. 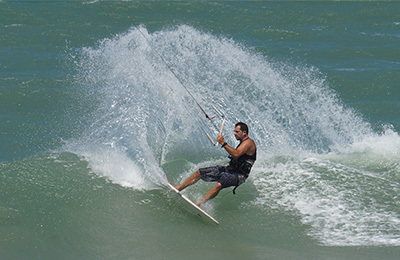 Ponta do Santo Cristo Kitesurf Hotel - São Miguel do Gostoso, Rio Grande do Norte Algehele gastenwaardering: ★★★★★ 5 gebaseerd op 1 beoordelingen. 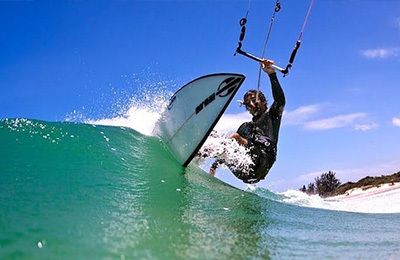 Flonianópolis Kitesurf & Surf House - Barra da Lagoa, Santa Catarina Algehele gastenwaardering: ☆☆☆☆☆ 0 gebaseerd op 0 beoordelingen. It is more than just a house, in addition to hosting you, offers fun, sports and entertainment. An ideal place for you who enjoys life and wants to enjoy new experiences. Felix Beach Amazing View Surf Villa - Ubatuba, São Paulo Algehele gastenwaardering: ☆☆☆☆☆ 0 gebaseerd op 0 beoordelingen. Cozy fully euiped apartments with an amazing view of Felix Beach, swimming pool, mini skate park, hammocks, ping pong table, and barbecue area. 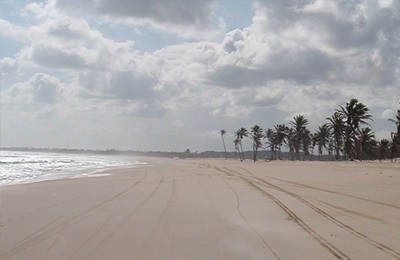 Located on the north of São Paulo´s coast. The place to be in Brazil, safe and wonderful! For Surf Classes Itamambuca Beach is the best option most of the days, perfect for all levels and ages. Much more activities available, check this out. 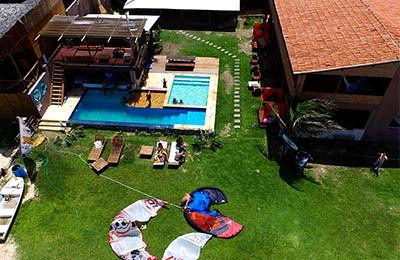 Atins Progression Kite & Yoga Camp - Barreirinhas, Maranhão Algehele gastenwaardering: ☆☆☆☆☆ 0 gebaseerd op 0 beoordelingen. Freestyle, wave, downwind, speed: here you’ll find everything incl. guaranteed wind. Combined with daily 1 ½ hours of Yoga in a peaceful boutique bed&breakfast. Barra de Sao Miguel Exclusive Beach Spa & Surf Resort - Maceio, Alagoas Algehele gastenwaardering: ☆☆☆☆☆ 0 gebaseerd op 0 beoordelingen. Ecological Reserve Beachfront Itamambuca Surf Resort - Ubatuba, São Paulo Algehele gastenwaardering: ☆☆☆☆☆ 0 gebaseerd op 0 beoordelingen. DREAM, LIVE, TRY! 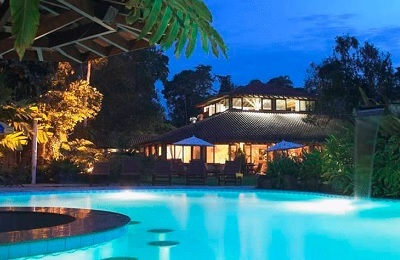 In a 100,000 m² built area, the Ecological Reserve Beachfront Itamambuca Surf Resort has 76 accommodations, divided into three categories of apartments: Master, Bungalow and Luxury, all with balcony facing the ecological reserve and decoration inspired by the beach theme, with local crafts. Sports court, tennis court, swimming pools, playground, fitness center, game room, dry sauna, TV room, kiosks with barbecue, restaurants, snack bar, mini market and boutique are some of the local leisure options. The recreational team organizes the programming to provide the well-being of the adults and kids. Ecological trails, kayaking in Rio Itamambuca, competitions, tennis games and interactive games are part of the daily life of those who stay in the Resort.